Super O went for her first language therapy session today. Her therapist, Chris, was very impressed with the progress she's made. Since she last saw her, on 9/25, she's been saying about 4-5 new words regularly. Her big ones are this and that. I'm very proud of her. We're moving onto using two word sentences like "eat food" and "bounce ball". When she uses a word, I'm supposed to add a word to it to make it a sentence. This method works best when the child is completely at ease, like when they're playing. Chris was doing it with her while playing with Play-Doh. Super O doesn't play well with me. She wants me to do something, I do it, then she changes her mind and gets mad at me so I decided to try the Play-Doh route. We stopped at the store and got a 10-pack and some tools. 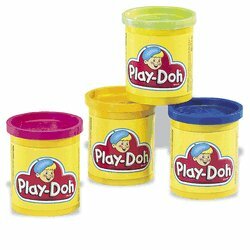 After dinner, we broke out the Play-Doh. I had soooo much fun with her. We put some music on, hits of the 80's on the cable music channel (she loves 80's music! ), and went to town. We made snakes, a snow man, cut-outs of our hands, a road, and bunches of balls. We played for an hour!! I can't remember the last time I played with her like that. I tend to get bogged down in the stress of our life. Between work, bills, housework, dealing with the speech thing and everything else I have to do I sometimes forget to take a few minutes out to appreciate my beautiful gift, Super O. She is such a funny kid! Of course, we used the play time to work on language. At one point, I made her a purple snake with blue eyes. She can say blue and eye so when she pointed at it's eyes, I said "blue eyes". She repeated me and ended up saying it about 5 or 6 times!! Then out of nowhere she pointed at the floor and said "home". I responded "O's home" and "Mommy's home". She repeated "O home" and pointed at herself, then "mama home" and pointed at me! She surprises me each and every day! !